This page is about the World War II nuclear project. The Manhattan Project conceived and created the first nuclear weapons and before using them in combat tested them just once in the Trinity test of July 16, 1945, which is shown here. The Manhattan Project was the project undertaken during World War II by the United States, the United Kingdom and Canada to develop the first nuclear weapon (atomic bomb). 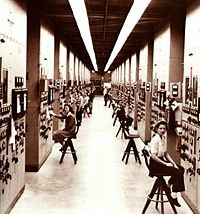 Formally designated as the Manhattan Engineering District (MED), Manhattan Project refers specifically to the period of the project from 1941-1946 under the control of the United States Army Corps of Engineers, under the administration of General Leslie Groves, with its scientific research directed by the American physicist J. Robert Oppenheimer. The project's roots lay in Allied scientists' fears from the 1930s that Nazi Germany might be developing nuclear weapons of its own. Born out of a small research program in 1939, the Manhattan Project eventually employed more than 130,000 people and cost nearly $2 billion USD ($24 billion in 2008 dollars based on the consumer price index). It resulted in the creation of multiple production and research sites that operated in secret. The three primary research and production sites of the project were the plutonium-production facility at what is now the Hanford Site in Washington state, the uranium-enrichment facilities at Oak Ridge, Tennessee, and the weapons research and design laboratory, now known as Los Alamos National Laboratory. Project research took place at more than thirty sites across the United States, Canada, and the United Kingdom. The MED maintained control over U.S. weapons production until the formation of the United States Atomic Energy Commission in January 1947. The Manhattan Project produced two atomic bombs that essentially ended the war when they were dropped on the Japanese cities of Hiroshima and Nagasaki. After the war, some of the Manhattan Project scientists became crusaders against nuclear armaments and others supported further research to improve the weapons. Still others applied their newly-acquired mastery of nuclear fission to developing controlled nuclear reactors for generating electricity from small quantities of nuclear fuel. Regardless of the attitudes of the Manhattan Project scientists in the post-war period, their releasing of the nuclear genie opened the way for a nuclear arms race between the United States and the Soviet Union that led to a massive proliferation of nuclear armaments. The basic principle of the atomic bomb is that of a chain reaction involving the destabilizing absorption of a neutron by a large atomic nucleus that subsequently fissions into two smaller fragments with the release of free neutrons and energy. The chain reaction is sustained as other large atomic nuclei are destabilized and fission after they absorb one of the released nuclei. The theory of the bomb was worked out by physicists mobilized primarily under the authority of the US army. Many of these were refugees driven out of Europe by Hitler's Third Reich. Hungarian scientists Leo Szilard and Eugene Wigner played an important role in persuading Albert Einstein to write a letter to President Roosevelt urging the importance of the US taking the lead for the Allies to develop nuclear weapons. That letter is credited as having been a major factor in Roosevelt's decision to go forward with the project. There are only two atomic nuclei whose properties allow for chain reaction fission to occur, and the Manhattan Project eventually used both. One fissionable nucleus is the uranium-235 isotope. This is found in natural uranium at a 1 percent concentration; the rest is uranium-238 which will not fission. To make an atomic bomb the U235 has to be highly "enriched"—the U238 has to be almost completely removed. The Manhattan Project used the differential diffusion of uranium fluoride to accomplish this separation. Current technology uses high-speed centrifuges. The other fissionable nucleus is plutonium-239. This is not to be found in nature at all and is created in a "breeder" nuclear reactor. In this, partially enriched U235 is allowed to fission in a controlled manner and the neutron flux is absorbed by a U238 blanket. The U239 generated undergoes a few relatively-fast rearrangements and ends up as the long-lasting plutonium-239 nucleus. The plutonium can be separated by simple chemical means from the uranium. Both the natural-uranium and manufactured-plutonium methods of making a bomb were developed during the Manhattan Project. The Hiroshima bomb was uranium-235; the Nagasaki bomb was plutonium-239. In both bombs, the chain-reaction fission process converted about a gram of matter into the energy of the explosion, a graphic proof of Einstein's E=mc² equation. 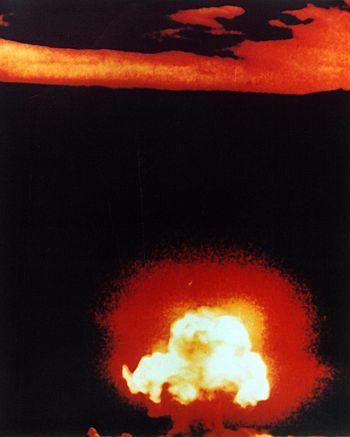 The project succeeded in developing and detonating three nuclear weapons in 1945: A test detonation of a plutonium implosion bomb on July 16 (the Trinity test) near Alamogordo, New Mexico; an enriched uranium bomb code-named "Little Boy" detonated on August 6 over Hiroshima, Japan; and a second plutonium bomb, code-named "Fat Man" on August 9, over Nagasaki, Japan. As scientific understanding of the atomic nucleus increased during the 1930s, so too did the concern among scientists opposed to the growing power of Nazi Germany that a German nuclear energy project might discover how to release nuclear energy explosively in a devastating weapon. The Manhattan Project descended from a small research program that began in 1939, and eventually grew to employ more than 130,000 people. The cost of the project was placed at nearly $2 billion USD, which in 2008 would be equivalent to nearly $24 billion based on CPI. The three primary research and production sites of the project were what is now the uranium-enrichment facilities at Oak Ridge, Tennessee, the plutonium-production facility at the Hanford Site near Richland, Washington, and the weapons research and design laboratory which is now Los Alamos National Laboratory in New Mexico. During the project, scientists at more than thirty different sites in the United States, Canada, and the United Kingdom collaborated in secret. The MED maintained control over U.S. weapons production until the formation of the Atomic Energy Commission in January 1947. Main articles: History of physics, History of nuclear weapons, World War II. The roots of the theory of fission reach two thousand years back when Democritus expounded the theory that matter is made up of atoms, small particles that cannot be split into smaller parts. In the first decades of the twentieth century, changes in the understanding of the physics of the atom occurred which resulted both in the recognition of nuclear fission as a potential energy source and the belief by a few that it might be used as a weapon. Chief among these developments were the discovery of a nuclear model of the atom, which by 1932 was thought to consist of a small, dense nucleus containing most of the mass of the atom in the form of protons and neutrons, surrounded by a shell of electrons. Work on the phenomena of radioactivity, first discovered in uranium ores by Henri Becquerel in 1896 and followed up by the work of Pierre and Marie Curie on radium, seemed to promise that atoms, previously thought to be ultimately stable and indivisible, actually had the potential of containing and releasing immense amounts of energy. In 1919 Ernest Rutherford achieved the first artificial nuclear disintegrations by bombarding nitrogen with alpha particles emitted from a radioactive source, thus becoming the first person in history to "split the atom" intentionally. It had become clear from the Curies' work that there was a tremendous amount of energy locked up in radioactive decay— far more than chemistry could account for. But even in the early 1930s such illustrious physicists as Rutherford and Einstein could see no way of artificially releasing that energy any faster than nature naturally allowed it to leave. "Radium engines" in the 1930s were the stuff of science fiction, such as was being written at the time by Edgar Rice Burroughs. Interestingly, H. G. Wells included in one of this stories the idea that "Atomic Bombs" could be developed if this energy could be controlled, and Leó Szilárd later commented that this story influenced his later research into this subject. Progress toward nuclear fission accelerated in the 1930s when further manipulation of the nuclei of atoms become possible. In 1932, Sir John Cockcroft and Ernest Walton were first to "split the atom" (cause a nuclear reaction) by the use of artificially accelerated particles. In 1934, Irène and Frédéric Joliot-Curie discovered that artificial radioactivity could be induced in stable elements by bombarding them with alpha particles. The same year Enrico Fermi reported similar results when bombarding uranium with neutrons (discovered in 1932), but did not immediately appreciate the consequences of his results. In December of 1938, Germans Otto Hahn and Fritz Strassmann published experimental results about bombarding uranium with neutrons, showing that it produced an isotope of barium. Shortly thereafter, their Austrian co-worker Lise Meitner (a political refugee in Sweden at the time) and her nephew Otto Robert Frisch correctly interpreted the results as the splitting of the uranium nucleus after the absorption of a neutron—nuclear fission—which released a large amount of energy and additional neutrons. In 1933, Hungarian physicist Leó Szilárd had proposed that if any neutron-driven process released more neutrons than those required to start it, an expanding nuclear chain reaction might result. Chain reactions were familiar as a phenomenon from chemistry then (where they typically caused explosions and other run-away reactions), but Szilárd was proposing them for a nuclear reaction, for the first time. However, Szilárd had proposed to look for such reactions in the lighter atoms, and nothing of the sort was found. Upon experimentation shortly after the uranium fission discovery, Szilárd found that the fission of uranium released two or more neutrons on average, and immediately realized that a nuclear chain reaction by this mechanism was possible in theory. Though Szilárd kept this secret for the time being, fearing its use as a weapon by fascist governments, and convinced others to do so also, identical results were soon published by the Joliot-Curie group, to his great dismay. That such mechanisms might have implications for civilian power or military weapons was perceived by a number of scientists in many countries, around the same time. While these developments in science were occurring, many political changes were happening in Europe. Adolf Hitler was appointed chancellor of Germany in January 1933. His anti-Semitic ideology caused all Jewish civil servants, including many physicists at universities, to be fired from their posts. Consequently many European physicists who would later make key discoveries went into exile in the United Kingdom and the United States. After Nazi Germany invaded Poland in 1939, World War II began, and many scientists in the United States and the United Kingdom became anxious about what Germany might do with nuclear technology. The idea that nuclear fission could be used for both the production of commercial energy and potentially for military purposes occurred to many scientists around the world almost simultaneously. Because of the escalating military conflict in Europe many scientists discontinued publication on the subject for fear of aiding enemy scientists with their research. The primary difficulty, it was soon determined by Niels Bohr and John Wheeler, was that only one isotope of uranium, uranium-235, underwent fission and only 0.7 percent of all uranium found in nature is uranium-235. The majority of uranium is uranium-238, the presence of which would actually tend to inhibit a fission chain reaction, by absorbing neutrons but not fissioning. 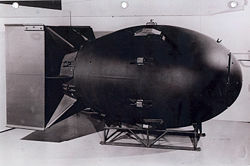 To make a uranium fission bomb would require the separation of the two almost identical isotopes of uranium with a relatively high degree of accuracy—a massive amount of effort, depending on how much uranium-235 (highly enriched uranium) was needed for a bomb, which had not yet been determined. In the United States, a group of three Hungarian Jewish refugee physicists, Leó Szilárd, Edward Teller, and Eugene Wigner believed that the energy released in nuclear fission might be used in bombs by the Germans. Germany had made many early discoveries in the physics of fission and still had a number of formidable physicists, including Werner Heisenberg, despite the expulsion of Jewish academics. These refugee scientists were desperate to encourage further research in the United States. Politically marginalized, however, they sought the assistance of Albert Einstein, easily the world's most famous physicist at the time and a Jewish refugee himself, in drafting a letter which they would attempt to have delivered to President Franklin D. Roosevelt. The Einstein-Szilárd letter was written on August 2, 1939, mostly by Szilárd, warning that "extremely powerful bombs of a new type may thus be constructed" by means of nuclear fission, and urging the President to establish funds for further research in the U.S. to determine its feasibility. The letter eventually made it to Roosevelt over a month later, who authorized the creation of an ad hoc Uranium Committee under the chairmanship of National Bureau of Standards chief Lyman Briggs. It began small research programs in 1939 at the Naval Research Laboratory in Washington, where physicist Philip Abelson explored uranium isotope separation. At Columbia University, Enrico Fermi, who had emigrated because his wife was Jewish, built prototype nuclear reactors using various configurations of natural uranium metal and highly purified graphite (which Szilárd had realized could be used to slow and prepare neutrons from the uranium to split more uranium). Work, however, proceeded at a relatively slow and uncoordinated pace, in part because the U.S. was not yet involved officially in World War II, and because Briggs was somewhat uncomfortable in pursuing the research. In 1940, the Uranium Committee became a section of the newly-established National Defense Research Committee (NDRC), run by the scientist-administrator Vannevar Bush, but was still a relatively small effort. The need for secrecy caused high compartimentalization of information, and because Bush therefore did not know about Einstein's letter or how the project had come into being, no extra effort was made under Bush's command to include Einstein in the project that Einstein himself had started. Einstein's leftist political convictions and the need for secrecy and distrust of leftists were enough to keep any of the project's managers from suggesting Einstein be approached on his own merits, as a physicist. One of the early sections of a particle accelerator responsible for development of the atomic bomb, and used to assist in research related to the Manhattan Project. While the U.S. research was pursued at a leisurely pace, work in the United Kingdom was occurring as well. In March 1940, at the University of Birmingham UK, Austrian Otto Frisch and German Rudolf Peierls calculated that an atomic weapon only needed 1 kilogram (2.2 pounds) of uranium-235, a far smaller amount than most scientists had originally expected, which made it seem highly possible that a weapon could be produced in a short amount of time. They sent their report, the Frisch-Peierls memorandum, to Henry Tizard, chairman of the Committee for the Scientific Survey of Air Warfare, the most important scientific committee in the British war effort. Tizard set up a sub-committee, the MAUD Committee, to investigate the feasibility in more depth, and after commissioning further research, the MAUD Committee produced their first report in March 1941. The committee confirmed that a uranium bomb could be produced using 25 pounds of uranium-235, and would produce an explosion equivalent to that of 1,800 tons of TNT. The research had also shown that isotopic separation of the required quantity of uranium-235 was technically feasible. In contrast, German physicist Werner Heisenberg had operated under the assumption that each neutron must split another atom to keep the chain reaction going, which resulted in a grave miscalculation of the mass of uranium-235 that was needed to start the chain reaction and keep it going (He calculated that it would take 130 tons of uranium to do just that). Heisenberg was also unaware of the properties of pure graphite, and knew of no easy way to prepare slow neutrons for a uranium splitting "machine" (later called a nuclear reactor). Meanwhile, in the U.S., the Uranium Committee had not made comparable progress. The first MAUD Report was sent from Britain to the USA in March 1941 but no comment was received from the U.S. A member of the MAUD Committee and Frisch's and Peierl's professor, Mark Oliphant, flew to the U.S. in August 1941 in a bomber to find out what was being done with the MAUD reports, and was horrified to discover that Lyman Briggs had simply locked them in his safe, telling nobody, not even the other members of the Uranium Committee, which had since become part of the Office of Scientific Research and Development in the summer of 1941, because the U.S. was "not at war." Little else happened until Oliphant visited Ernest Lawrence, James Conant, chairman of the NDRC, and Enrico Fermi and told them of the MAUD Report. Lawrence also contacted Conant and Arthur Compton, a physicist and Nobel laureate at the University of Chicago, convincing them that they should take Frisch's and Peierl's work very seriously, and collectively, along with Vannevar Bush, an aggressive campaign was made to wrest the weapons research out of the hands of Briggs and to encourage an all-out program. The National Academy of Sciences then proposed an all-out effort to build nuclear weapons. On October 9, 1941, Bush impressed upon Roosevelt at a meeting the need for an accelerated program, and by November Roosevelt had authorized an "all-out" effort. A new policy committee, the Top Policy Group, was created to inform Roosevelt of bomb development, and allow Bush and his colleagues to guide the project. The first meeting of the group, which discussed the reorganization of the S-1 committee research, took place on December 6, 1941—the day before the Japanese attack on Pearl Harbor and the entrance of the United States into World War II. A few months after he was put in charge of fast neutron research, Berkeley physicist Robert Oppenheimer convened a conference on the topic of nuclear weapon design. Having begun to wrest control of the uranium research from the National Bureau of Standards, the project heads began to accelerate the bomb project under the OSRD. Arthur Compton organized the University of Chicago Metallurgical Laboratory in early 1942 to study plutonium and fission piles (primitive nuclear reactors), and asked theoretical physicist Robert Oppenheimer of the University of California, Berkeley to take over research on fast neutron calculations, key to calculations about critical mass and weapon detonation, from Gregory Breit. 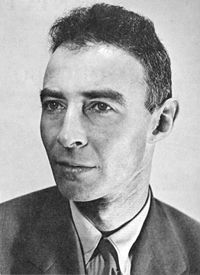 John Manley, a physicist at the Metallurgical Laboratory, was assigned to help Oppenheimer find answers by coordinating and contacting several experimental physics groups scattered across the country. During the spring of 1942, Oppenheimer and Robert Serber of the University of Illinois worked on the problems of neutron diffusion (how neutrons moved in the chain reaction) and hydrodynamics (how the explosion produced by the chain reaction might behave). To review this work and the general theory of fission reactions, Oppenheimer convened a summer study at the University of California, Berkeley in June 1942. Theorists Hans Bethe, John Van Vleck, Edward Teller, Felix Bloch, Emil Konopinski, Robert Serber, Stanley S. Frankel, and Eldred C. Nelson (the latter three all former students of Oppenheimer) quickly confirmed that a fission bomb was feasible. There were still many unknown factors in the development of a nuclear bomb, however, even though it was considered to be theoretically possible. The properties of pure uranium-235 were still relatively unknown, as were the properties of plutonium, a new element which had only been discovered in February 1941 by Glenn Seaborg and his team. Plutonium was the product of uranium-238 absorbing a neutron which had been emitted from a fissioning uranium-235 atom, and was thus able to be created in a nuclear reactor. But at this point no reactor had yet been built, so while plutonium was being pursued as an additional fissile substance, it was not yet to be relied upon. Only microgram quantities of plutonium existed at the time (produced from neutrons derived from reaction started in a cyclotron) and plutonium's properties were still largely unknown. A number of the different fission bomb assembly methods explored during the summer 1942 conference, later reproduced as drawings in The Los Alamos Primer. In the end, only the "gun" method (at top) and a more complicated variation of the "implosion" design would be used. At the bottom are "autocatalytic method" designs. The scientists at the Berkeley conference determined that there were many possible ways of arranging the fissile material into a critical mass, the simplest being the shooting a "cylindrical plug" into a sphere of "active material" with a "tamper"—dense material which would focus neutrons inward and keep the reacting mass together to increase its efficiency (this model "avoids fancy shapes," Serber would later write). They also explored designs involving spheroids, a primitive form of "implosion" (suggested by Richard C. Tolman), and explored the speculative possibility of "autocatalytic methods" which would increase the efficiency of the bomb as it exploded. Considering the idea of the fission bomb theoretically settled until more experimental data was available, the conference then turned in a different direction. 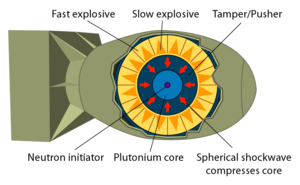 Hungarian physicist Edward Teller pushed for discussion on an even more powerful bomb: The "Super," which would use the explosive force of a detonating fission bomb to ignite a fusion reaction in deuterium and tritium. This concept was based on studies of energy production in stars made by Hans Bethe before the war, and suggested as a possibility to Teller by Enrico Fermi not long before the conference. When the detonation wave from the fission bomb moved through the mixture of deuterium and tritium nuclei, these would fuse together to produce much more energy than fission could. But Bethe was skeptical. As Teller pushed hard for his "superbomb"—now usually referred to as a "hydrogen bomb"—proposing scheme after scheme, Bethe refuted each one. The fusion idea had to be put aside in order to concentrate on actually producing fission bombs. Teller also raised the speculative possibility that an atomic bomb might "ignite" the atmosphere, due to a hypothetical fusion reaction of nitrogen nuclei. Bethe calculated, according to Serber, that it could not happen. In his book The Road from Los Alamos, Bethe says a refutation was written by Konopinski, C. Marvin, and Teller as report LA-602, showing that ignition of the atmosphere was impossible, not just unlikely. In Serber's account, Oppenheimer unfortunately mentioned it to Arthur Compton, who "didn't have enough sense to shut up about it. It somehow got into a document that went to Washington" which led to the question "never [being] laid to rest." The conferences in the summer of 1942 provided the detailed theoretical basis for the design of the atomic bomb, and convinced Oppenheimer of the benefits of having a single centralized laboratory to manage the research for the bomb project, rather than having specialists spread out at different sites across the United States. The project originally was headquartered in an office at the federal building at 90 Church Street in Manhattan. That is how it became known as the Manhattan Project, even though the project was based only briefly on Manhattan island. Though it involved over thirty different research and production sites, the Manhattan Project was largely carried out in three secret scientific cities and one public site that were established by power of eminent domain: Los Alamos, New Mexico; Oak Ridge, Tennessee; and Hanford, Washington. The Tennessee site was chosen for the vast quantities of cheap hydroelectric power already available there (see Tennessee Valley Authority) necessary to produce uranium-235 in giant ion separation magnets. Hanford was additionally chosen to be near a river for cooling the reactors which would produce the plutonium. All of the sites were suitably far from coastlines and possible enemy attack from Germany or Japan. The Los Alamos National Laboratory was built on a mesa that previously hosted the Los Alamos Ranch School, a private school for teenaged boys. The site was chosen primarily for its remoteness. Oppenheimer had known of it from his horse-riding near his ranch in New Mexico, and showed it as a possible site, to the government representatives, which promptly bought it. In addition to being the main "think-tank," Los Alamos was responsible for final assembly of the bombs, mainly from materials and components produced by other sites. Manufacturing at Los Alamos included casings, explosive lenses, and fabrication of fissile materials into bomb cores. Oak Ridge facilities covered more than 60,000 acres (243 km²) of several former farm communities in the Tennessee Valley area. Some Tennessee families were given two weeks' notice to vacate family farms that had been their home for generations. So secret was the site during WW2 that the state governor was unaware that Oak Ridge (what was to become the fifth largest city in the state) was being built. At one point Oak Ridge plants were consuming 1/6th of the electrical power produced in the U.S., more than New York City. Oak Ridge mainly produced uranium-235. Hanford Site, which grew to almost 1000 square miles (2,600 km²), took over irrigated farm land, fruit orchards, a railroad, and two farming communities, Hanford and White Bluffs, in a sparsely populated area adjacent to the Columbia River. Hanford hosted nuclear reactors cooled by the river, and was the plutonium production center. The existence of these sites and the secret cities of Los Alamos, Oak Ridge, and Hanford were not made public until the announcement of the Hiroshima explosion, and remained secret until the end of WWII. Chicago pile—1 As the Manhattan project progressed, Fermi and his crew worked on what was to be the first nuclear chain reaction. The reactor was called CP-1 or Chicago Pile—1. 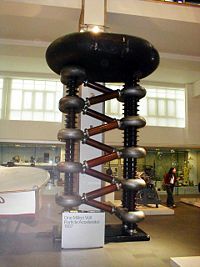 The world's first atomic reactor was 8 meters in diameter and 6 meters in height. It was constructed—under the stands of a tennis stadium—of 385 metric tons of graphite with 46 metric tons of uranium in 2-kilogram blocks distributed in a lattice throughout. On Wednesday, 2 December 1942, at 3:25 p.m., the experiment was run successfully, they were able to control the fission of uranium. The power generated by this very first nuclear reactor was just 40 watts—equivalent to a dim light bulb or a burning match—and after just 28 minutes of operation the reaction was stopped by inserting cadmium strips to mop up all the neutrons and quench the chain reaction. 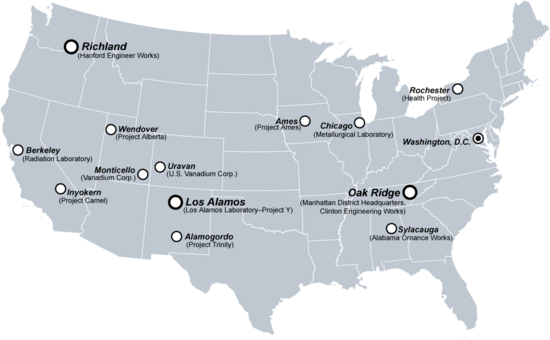 A selection of U.S. sites important to the Manhattan Project. The measurements of the interactions of fast neutrons with the materials in a bomb were essential because the number of neutrons produced in the fission of uranium and plutonium must be known, and because the substance surrounding the nuclear material must have the ability to reflect, or scatter, neutrons back into the chain reaction before it is blown apart in order to increase the energy produced. Therefore, the neutron scattering properties of materials had to be measured to find the best reflectors. Estimating the explosive power required knowledge of many other nuclear properties, including the cross section (a measure of the probability of an encounter between particles that result in a specified effect) for nuclear processes of neutrons in uranium and other elements. Fast neutrons could only be produced in particle accelerators, which were still relatively uncommon instruments in 1942. The need for better coordination was clear. By September 1942, the difficulties in conducting studies on nuclear weapons at universities scattered throughout the country indicated the need for a laboratory dedicated solely to that purpose. A greater need was the construction of industrial plants to produce uranium-235 and plutonium—the fissionable materials to be used in the weapons. Vannevar Bush, the head of the civilian Office of Scientific Research and Development (OSRD), asked President Roosevelt to assign the operations connected with the growing nuclear weapons project to the military. Roosevelt chose the Army to work with the OSRD in building production plants. The Army Corps of Engineers selected Col. James Marshall to oversee the construction of factories to separate uranium isotopes and manufacture plutonium for the bomb. Marshall and his deputy, Col. Kenneth Nichols, struggled to understand the proposed processes and the scientists with whom they had to work. Thrust into the new field of nuclear physics, they felt unable to distinguish between technical and personal preferences. Although they decided that a site near Knoxville would be suitable for the first production plant, they did not know how large the site needed to be and delayed its acquisition. Because of its experimental nature, the nuclear weapons work could not compete with the Army's more urgent tasks for priority. The scientists' work and production plant construction often were delayed by Marshall's inability to obtain critical materials, such as steel, needed in other military projects. Selecting a name for the project was difficult. The title chosen by Gen. Brehon B. Somervell, "Development of Substitute Materials," was objectionable because it seemed to reveal too much. 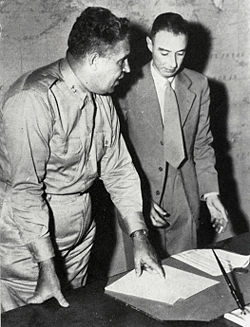 General Leslie Groves (left) was appointed the military head of the Manhattan Project, while Robert Oppenheimer (right) was the scientific director. Vannevar Bush became dissatisfied with Marshall's failure to get the project moving forward expeditiously, and made this known to Secretary of War Stimson and Army Chief of Staff George Marshall. Marshall then directed General Somervell to replace Col. Marshall with a more energetic officer as director. In the summer of 1942, Col. Leslie Groves was deputy to the chief of construction for the Army Corps of Engineers and had overseen the very rapid construction of the Pentagon, the world's largest office building. He was widely respected as an intelligent, hard driving, though brusque officer who got things done in a hurry. Hoping for an overseas command, Groves vigorously objected when Somervell appointed him to the weapons project. His objections were overruled and Groves resigned himself to leading a project he thought had little chance of success. Groves appointed Oppenheimer as the project's scientific director, to the surprise of many. (Oppenheimer's radical political views were thought to pose security problems.) However, Groves was convinced Oppenheimer was a genius who could talk about and understand nearly anything, and he was convinced such a man was needed for a project such as the one being proposed. Groves renamed the project The Manhattan District. The name evolved from the Corps of Engineers practice of naming districts after its headquarters' city (Marshall's headquarters were in New York City). At that time, Groves was promoted to brigadier general, giving him the rank necessary to deal with senior scientists in the project. Within a week of his appointment, Groves had solved the Manhattan Project's most urgent problems. His forceful and effective manner was soon to become all too familiar to the atomic scientists. The first major scientific hurdle of the project was solved on December 2, 1942, beneath the bleachers of Stagg Field at the University of Chicago, where a team led by Enrico Fermi initiated the first self sustaining nuclear chain reaction in an experimental reactor named Chicago Pile-1. A coded phone call from Compton saying, "The Italian navigator [referring to Fermi] has landed in the new world, the natives are friendly" to Conant in Washington, DC, brought news of the experiment's success. The Hiroshima bomb, Little Boy, was made from uranium-235, a rare isotope of uranium that has to be physically separated from the more plentiful uranium-238 isotope, which is not suitable for use in an explosive device. Since U-235 is only 0.7 percent of raw uranium and is chemically identical to the 99.3 percent of U-238, various physical methods were considered for separation. Control panels and operators for calutrons at the Y-12 Plant in Oak Ridge, Tennessee. One method of separating uranium 235 from raw uranium ore was devised by Franz Simon and Nicholas Kurti, two Jewish émigrés, at Oxford University. Their method using gaseous diffusion was scaled up in large separation plants at Oak Ridge Laboratories and used uranium hexafluoride (UF6) gas as the process fluid. This method eventually produced most of the U-235, although it was also important for producing partly enriched material to feed the calutrons (see below), which also produced significant U-235. Another method—electromagnetic isotope separation, was developed by Ernest Lawrence at the University of California Radiation Laboratory at the University of California, Berkeley. This method employed devices known as calutrons, which were effectively mass spectrometers. Initially the method seemed promising for large scale production, but was expensive and produced insufficient material, and was later abandoned after the war. Other techniques were also tried, such as thermal diffusion. Most of this separation work was performed at Oak Ridge. The uranium bomb was a gun-type fission weapon. One mass of U-235, the "bullet," is fired down a more or less conventional gun barrel into another mass of U-235, rapidly creating the critical mass of U-235, resulting in an explosion. The method was so certain to work that no test was carried out before the Bomb was dropped over Hiroshima. Also, the bomb dropped used all the existing extremely highly purified U-235 (and even most of the highly purifed material) so there was no U-235 available for such a test anyway. The basic concept of an implosion-style nuclear weapon. The bombs used in the first test at Trinity Site July 16th 1945, New Mexico (the gadget of the Trinity test), and in the Nagasaki bomb, Fat Man, were made primarily of plutonium-239, a synthetic element. Although uranium-238 is useless as fissile isotope for an atomic bomb, U-238 is used to produce plutonium. The fission of U-235 produces relatively slow neutrons which are absorbed by U-238, which after a few days of decay turns into plutonium-239. The production and purification of plutonium used techniques developed in part by Glenn Seaborg while working at Berkeley and Chicago. Beginning in 1943, huge plants were built to produce plutonium at the Hanford Site, outside of Richland, Washington. From 1943-1944, development efforts were directed to a gun-type fission weapon with plutonium, called "Thin Man." Once this would be achieved, the uranium version "Little Boy" would require a relatively simple adaptation, it was thought. Initial tests of the properties of plutonium were done using cyclotron-generated plutonium-239, very pure but in very small amounts. On April 5, 1944, Emilio Segrè at Los Alamos received the first sample of Hanford-produced plutonium. Within ten days, he discovered a fatal flaw: Reactor-bred plutonium was far less pure than cyclotron-produced plutonium, and as a result had a much higher spontaneous fission rate than uranium-235. The isotope responsible for this high fission rate was plutonium-240, formed from plutonium-239 by capture of an additional neutron. Unlike the cyclotron, the plutonium breeding reactors had a much higher neutron flux due to the increased proportion of plutonium-240 in them, as compared to cyclotron bred plutonium. Plutonium- 240 was even harder to separate from plutonium-239 than U-235 was to separate from U-238, so there was no question of doing so. The contaminating Pu-240 had to stay in the plutonium metal used in the bomb, where its spontaneous fissions were a source of unwanted neutrons. The implications of this made a "gun" detonation mechanism unsuitable. Due to the relatively slow speed of the gun device, "early" neutrons from spontaneously fissioning Pu-240 would start the reaction before the device was fully assembled by the gun process, and as a result, a plutonium bomb would "fizzle" (that is, heat up and blow itself apart) before it could be turned into an efficient shape to developing an efficient chain reaction configuration which would split a substantial amount of the plutonium. Even a 1 percent fission of the material would result in a workable bomb, almost a thousand times more powerful than conventional bombs for the weight; but a fizzle promised far less even than this. In July 1944, the decision was made to cease work on the plutonium gun method. There would be no "Thin Man." The gun method was further developed for uranium only, which had few complications. Most efforts were now directed to a different method for plutonium. In July 1944, the laboratory abandoned the plutonium gun-type bomb ("Thin Man," shown above) and focused almost entirely on the problem of implosion. Ideas of using alternative detonation schemes had existed for some time at Los Alamos. One of the more innovative had been the idea of "implosion"—a sub-critical sphere of fissile material could, using chemical explosives, be forced to collapse in on itself, creating a very dense critical mass, which because of the very short distances the metal need to travel to make it, would come into existence for a far shorter time than it would take to assemble a mass from a bullet. Initially, implosion had been entertained as a possible, though unlikely method. However, after it was discovered that it was the only possible solution for using reactor-bred plutonium, and that uranium-235 production could not be substantially increased, the implosion project received the highest priority, as the only solution to scaling up fissionable material production to the level needed for multiple bombs. By the end of July, 1944, the entire project had been reorganized around solving the implosion problem. It eventually involved using shaped charges with many explosive lenses to produce the perfectly spherical explosive wave needed to properly compress the plutonium sphere. Because of the complexity of an implosion-style weapon, it was decided that, in spite of the waste of fissile material, an initial test would be required. The first nuclear test took place on July 16, 1945, near Alamogordo, New Mexico, under the supervision of Groves's deputy Brig. Gen. Thomas Farrell. This test was dubbed by Oppenheimer "Trinity." A similar effort was undertaken in the USSR in September 1941, headed by Igor Kurchatov (with some of Kurchatov's World War II knowledge coming secondhand from Manhattan Project countries, thanks to spies, including at least two on the scientific team at Los Alamos, Klaus Fuchs and Theodore Hall, unknown to each other). After the MAUD Committee's report, the British and Americans exchanged nuclear information, but initially did not pool their efforts. A British project, code-named Tube Alloys, was started, but did not have American resources. Consequently the British bargaining position worsened and their motives were mistrusted by the Americans. Collaboration therefore lessened markedly until the Quebec Agreement of August 1943, when a large team of British and Canadian scientists joined the Manhattan Project. The question of Axis efforts on the bomb has been a contentious issue for historians. It is believed that token efforts in Germany, headed by Werner Heisenberg, and in Japan, were also undertaken during the war with little progress. It was initially feared that Hitler was very close to developing his own bomb. Many German scientists in fact expressed surprise to their allied captors when the bombs were detonated in Japan. They were convinced that talk of atomic weapons was merely propaganda. However, Werner Heisenberg (by then imprisoned in England at Farm Hall with a number of other nuclear project physicists) almost immediately figured out what the allies had done, explaining it to his fellow scientists (and hidden microphones) within days. The Nazi reactor effort had been severely handicapped by Heisenberg's belief that heavy water was necessary as a neutron moderator (slowing preparation material) for such a device. 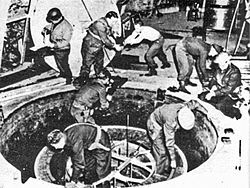 The Germans were short of heavy water throughout the war due to Allied efforts to see they didn't get it and the Germans never did stumble on the secret of purified graphite for making nuclear reactors from natural uranium. Bohr, Heisenberg and Fermi were all colleagues who were key figures in developing the quantum theory together with Wolfgang Pauli, prior to the war. They had known each other well in Europe, and were friends. Niels Bohr and Heisenberg even discussed the possibility of the atomic bomb prior to and during the war, before the United States became involved. Bohr recalled that Heisenberg was unaware that the supercritical mass could be achieved with U-235, and both men would give differing accounts of their conversations at this sensitive time. Bohr at the time did not trust Heisenberg, and never quite forgave him for his decision not to flee Germany before the war, when given the chance. Heisenberg, for his part, seems to have thought he was proposing to Bohr a mutual agreement between the two sides not to pursue nuclear technology for destructive purposes. If so, Heisenberg's message did not get through. Heisenberg, to the end of his life, maintained that the partly-built German heavy-water nuclear reactor found after the war's end in his lab was for research purposes only, and a full bomb project had never at any time been contemplated (there is no evidence to contradict this, but by this time late in the war, Germany was far from having the resources for a Hanford-style plutonium bomb, even if they had decided to pursue one and had known how to do it). Together with the cryptographic efforts centered at Bletchley Park and also at Arlington Hall, the development of radar and computers in the UK and later in the US, and the jet engine in the UK and Germany, the Manhattan Project represents one of the few massive, secret, and outstandingly successful technological efforts spawned by the conflict of World War II. ↑ Stephen I. Schwartz, Atomic Audit: The Costs and Consequences of U.S. Nuclear Weapons (Washington, D.C.: Brookings Institution Press, 1998, ISBN 0815777736). ↑ Robert Serber, The Los Alamos Primer (Los Alamos Report LA-1, compiled April 1943, declassified 1965), 21. ↑ FAS, Konopinski, C. Marvin, and Teller, Report LA-602, declassified Feb. 1973. Retrieved August 11, 2007. ↑ Travel Goat, The Real Manhattan Project. Retrieved August 11, 2007. Badash, Lawrence, Joseph O. Hirschfelder, Herbert P. Broida (eds.). 1980. Reminiscences of Los Alamos, 1943-1945. Dordrecht, Boston MA: D. Reidel. ISBN 90-277-1097-X. Bethe, Hans A. 1991. The Road from Los Alamos. New York, NY: Simon and Schuster. ISBN 0-671-74012-1. DeGroot, Gerard. 2005. The Bomb: A History of Hell on Earth. London, UK: Pimlico. ISBN 0-7126-7748-8. Groueff, Stephane. 1967. Manhattan Project: The Untold Story of the Making of the Atomic Bomb. Boston, MA: Little, Brown & Co. ASIN B000OLTKFG. Groves, Leslie. 1962. Now it Can be Told: The Story of the Manhattan Project. New York, NY: Harper. ISBN 0-306-70738-1. Herken, Gregg. 2002. Brotherhood of the Bomb: The Tangled Lives and Loyalties of Robert Oppenheimer, Ernest Lawrence, and Edward Teller. New York, NY: Henry Holt and Co. ISBN 0-8050-6588-1. Hewlett, Richard G., and Oscar E. Anderson. 1962. The New World, 1939-1946. University Park, PA: Pennsylvania State University Press. ASIN: B000J30DBE. Hoddeson, Lillian, Paul W. Henriksen, Roger A. Meade, and Catherine L. Westfall. 1993. Critical Assembly: A Technical History of Los Alamos During the Oppenheimer Years, 1943-1945. New York, NY: Cambridge University Press. ISBN 0-521-44132-3. Howes, Ruth H. and Caroline L. Herzenberg. 1999. Their Day in the Sun: Women of the Manhattan Project. Philadelphia, PA: Temple University Press. ISBN 1-56639-719-7. Jungk, Robert. 1958. Brighter Than a Thousand Suns: A Personal History of the Atomic Scientists. NY: Harcourt, Brace. ASIN B000R0CFLU. Nichols, Kenneth David. 1987. The Road to Trinity: A Personal Account of How America's Nuclear Policies Were Made. New York, NY: William Morrow and Company Inc. ISBN 0-688-06910-X. Norris, Robert S. 2002. Racing for the Bomb: General Leslie R. Groves, The Manhattan Project's Indispensable Man. Hanover, NH: Steerforth Press. ISBN 1-58642-067-4. Rhodes, Richard. 1986. The Making of the Atomic Bomb. New York, NY: Simon & Schuster. ISBN 0-671-44133-7. Rhodes, Richard. 1995. Dark Sun: The Making of the Hydrogen Bomb. New York, NY: Simon & Schuster. ISBN 0-684-80400-X. Serber, Robert. 1998. Peace and War: Reminiscences of a Life on the Frontiers of Science. New York, NY: Columbia University Press. ISBN 0-231-10546-0. Sherwin, Martin J. 1975. A World Destroyed: The Atomic Bomb and the Grand Alliance. New York, NY: Alfred A. Knopf. ISBN 0-394-49794-5. Smyth, Henry DeWolf. 1945. Atomic Energy for Military Purposes; the Official Report on the Development of the Atomic Bomb under the Auspices of the United States Government, 1940-1945. Princeton, NJ: Princeton University Press. ASIN: B0007DOBKK. Annotated bibliography for the Manhattan Project from the Alsos Digital Library for Nuclear Issues. Nuclear Files.org Information on the history of the Manhattan Project. The Manhattan Project: Making the Atomic Bomb from atomicarchive.com. Atomic Heritage Foundation Manhattan Project Historic Preservation. Interview with Joseph Rotblat who worked on the Manhattan Project and left to work for Pugwash. The Nobel Peace Prize was awarded to both Rotblat and Pugwash. Freeview video provided by the Vega Science Trust. This page was last modified on 9 August 2018, at 16:11.